The Boulder-Nablus Sister City Project is working in collaboration with the Give Back Yoga Foundation, Calming Kids Yoga, the Sacramento-Bethlehem Sister City, Saha Wellness of Sacramento, and Muscatine Iowa Sister Cities to bring three yoga teachers from the West Bank (Ramallah, Nablus and Bethlehem) to visit our three cities: Muscatine, IA, Boulder, CO, and Sacramento, CA. We have designed an itinerary for our visitors that will be full of yoga teacher training opportunities. Our three yoga teachers intend to bring back to their communities the yoga training that they gain during this exchange. Suheir from Ramallah works in education, as an inclusive education specialist and facilitated the Transformative Life Skills (TLS) training for East Jerusalem schools that she works with. She also teaches yoga to the school teachers in her program. She is interested in pursuing further yoga education, specifically in yoga therapy, and yoga for kids with special needs. Mirna from Nablus, completed two courses with Anahata, and is the head of Farashe Yoga Nablus. She is a business owner, and has a background in medicine. She has done an incredible job introducing yoga to Nablus, teaching as many as 12 classes a week as a volunteer in schools, gyms, community centers, homes. She also introduced TLS into 4 governmental schools in Nablus. Mirna has incredible initiative, and passion for learning. Once she learns something, there’s no stopping her in bringing it to the community. She is interested in yoga therapy, and yoga in schools. 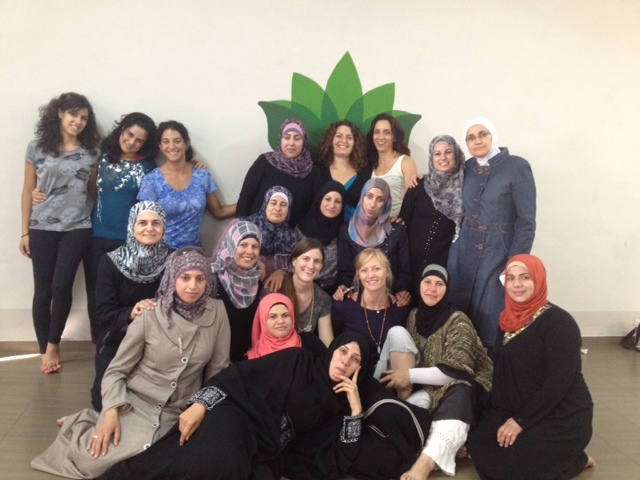 Abeer, Zatareh village (in Bethlehem district), also completed Anahata’s course. She is a social worker that works for an NGO that provides services to cancer patients. She teaches groups of young cancer patients very gentle yoga and breathing, their caregivers Yoga Nidra, and siblings of the patients kids yoga. She amazes me with her creativity and initiative as well. She is interested in kids yoga, and yoga therapy. You can read more about the training that has been happening in the West Bank. We need your help organizing for their visit: we plan to hold a reception while they are in Boulder. We will also be engaging in a variety of fundraising events and efforts. Please let us know if you would like to help.